I am very excited to have this latest quilt finished to share with you. 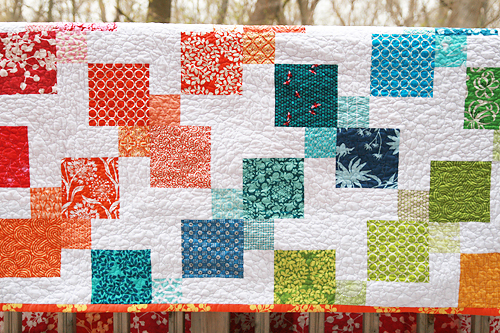 I planned this one last month and instantly knew this would be a great choice as my second free quilt pattern to offer on my blog. It really is a rainbow of color. Although my 4 year old is quite disturbed that I did not include purple. Honestly I just don't have a lot of purple fabric. No fear, you can always replace the brown with purple if you'd like. 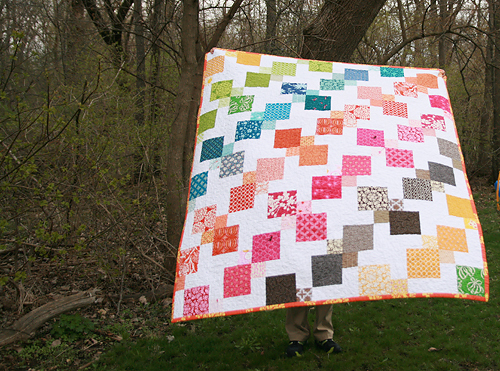 This is a great quilt for beginners. The cutting is easy. 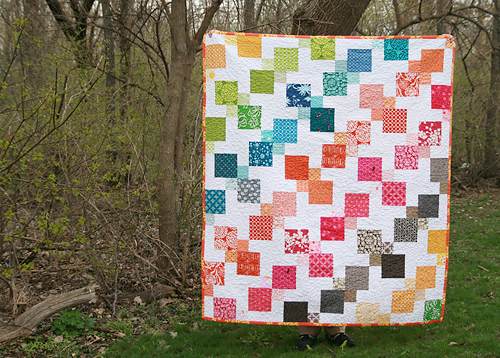 Each block only has 4 pieces so they go together rather quickly, especially if you are chain piecing. 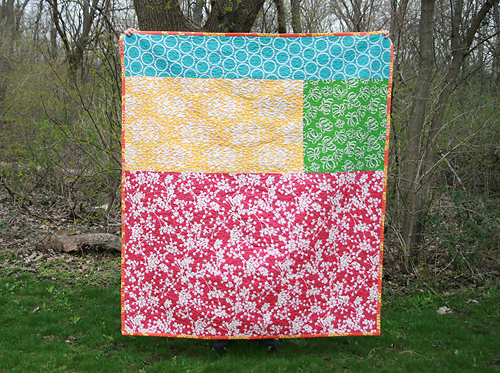 I used a variety of fabrics from my stash in order to have a scrappy look, but I think this pattern would look just as nice with solids, or all fabrics from one collection such as Denyse Schmidt's Katie Jump Rope. The backing is my new favorite style of giant randomly placed blocks of fabric. I dug into my out of print fabric stash that I have been hanging on to - it felt good to really use it in large chunks. Kind of like spring cleaning for the fabric soul. The binding is an old print from Anna Maria Horner's Garden Party line. This was the only print I had from the line and have been wondering what to do with it for awhile now, so again, it was good to see it in action. I quilted this one free motion style. The final size is about 63" x 72". It will be listed in the shop shortly. I am finalizing the graphics and details for the pattern for this one and will post it probably no later than tomorrow! I hope you will come back and make one yourself. As always, you can find links to my patterns on the right column of this page, or by clicking on the Quilt + Patchwork Patterns tab at the top. Update - the pattern is now available!